Style of the week is the ace 'Aftermath' polo. Only recently arrived at Madcap England and already everyone is loving this fab Mod polo! Oozing in 1960s Mod styling, this classic Retro polo is a must have! The 'Aftermath' polo features vertical engineered stripe detailing which accentuates both sides of this stylish polo. Inspired by 1960s Kings Road and Carnaby Street fashions it features a tonal placket and classic ribbed trims - a smart and sophisticated Mod piece! This ace polo is available in three cool colour ways, making sure threes an Aftermath polo for you! 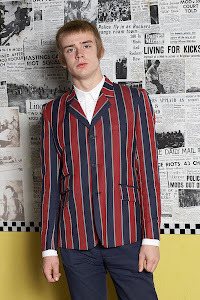 New colour in the Madcap England 'Ealing' Jacket!